« Real American as Apple Pie? The weather is getting colder, and soup and stew is on the menu again. If you’re organized, you can make stew well ahead of time and put it in the crock pot. But you’ll still have times when you get home from work, and realize there is nothing to eat. And you want soup, and not that canned junk. This is the soup for that moment. You’ve seen it before- It’s All Over– just for where I’ve seen it online in the past month. But it’s so much more versatile. 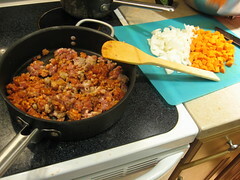 Meat- Sausage is easiest, try Italian, or a mix of Italian and Chorizo for some spice. Pancetta, prosciutto, or bacon work as well. Shred anything you already have cooked, like leftover roast chicken. I’ve done it without any of them when making it for vegetarians, but it does add a lot of flavor. I use 2-4 sausages, but you only need about 2-6 oz of bacon to get the flavor! Stock. I go with reduced sodium chicken stock. Unless I’m doing vegetarian, at which point sometimes I just go with water and cook it longer. I use about half a box of stock, but I would probably use a full box if I had a bigger pot. Tomatoes. I wouldn’t go with anything fresh here. A can of diced is fine, but I usually go with whole and dice them myself. I use a full 28 oz can. Garlic. Basil. Although if you go with one of the cans of tomatoes with these in it, I suppose you can skip this step. I wouldn’t. But you could. One or two cloves of garlic, at least a teaspoon of basil. But I just shake. Something Green. Kale, escarole, spinach, whatever’s good at the farmer’s market… We just use the baby spinach that’s just about to go bad when we don’t feel like having a salad. It’s a sad way to use the baby spinach, but at least it’s getting used. It wilts down quite a bit, so a couple cups doesn’t go very far. Break it down into managable chunks, but again, it’s going to wilt. I don’t bother cutting or ripping the baby spinach, if that helps. Pasta. Something small. The last time I was at the store, I found that Barilla is now making smaller versions of all sorts of shapes. Onions. One small to medium onion. Celery, I suppose, although I don’t like it. Bell Peppers (we keep a Trader Joe’s Jar of Roasted Red Peppers in the fridge)– maybe one pepper, if using raw? If you use canned, consider rinsing some of the oil off. I forgot to. Beans- Cannellini Beans are good. You can smoosh them, leave them whole, or a mixture. One or two cans. You could soak your own, but then it would be weekend soup. Parmesan. I can’t eat it, but it’s still good. It’s a great use for the rinds! Toasted or stale bread— it’s even better if you rub garlic on it. Other spices. 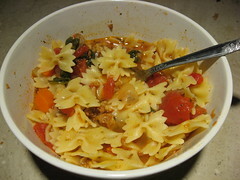 Bay leaf, oregano, crushed red pepper, etc. Take sausage out of its casing, slice bacon– make your meat of choice small. Cook it through on medium heat– about 5 minutes, although possibly less for the bacon-like substances. Drain excess grease. Add onions, garlic, carrots, celery, peppers, mushrooms. Saute until onions are translucent, or 5-ish minutes. Add the tomatos, and spices or herbs you haven’t yet added, beans, parmesan, and the stock. Double check what your stock says before you add salt (adding normal sodium stock and salt is an easy way to oversalt). Let simmer. Start the pasta water if you’re going to add pasta. If you’re going to eat it all at once, cook the pasta to a slightly crunchier al dente, and then cook it for a minute or two in the soup. If you’re going to have leftovers, adding the pasta in will make it mooshy when you reheat it. If you’re not going to add pasta, just let the soup simmer for at least 10 minutes. Fish out the parmesan rinds and the bay leaves. Add the greens, stir until wilted. Serve with bread on top, and more parmesan. Between the beans, bread, and pasta, I would only use two at a time. One is fine. Use whatever veggies you have and like. Clean out your fridge. The more stock you add, the more it’s a soup. If you add less… it’s more of a stew. Either is fine– I’ve been closer to stew, since I don’t have any large pots right now.